Bill Atkinson worked mostly at home, but whenever he made significant progress he rushed in to Apple to show it off to anyone who would appreciate it. This time, he visited the Macintosh offices at Texaco Towers to show off his brand new oval routines, which were implemented using a really clever algorithm. Bill had added new code to QuickDraw (which was still called LisaGraf at this point) to draw circles and ovals very quickly. That was a bit hard to do on the Macintosh, since the math for circles usually involved taking square roots, and the 68000 processor in the Lisa and Macintosh didn't support floating point operations. But Bill had come up with a clever way to do the circle calculation that only used addition and subtraction, not even multiplication or division, which the 68000 could do, but was kind of slow at. Bill's technique used the fact the sum of a sequence of odd numbers is always the next perfect square (For example, 1 + 3 = 4, 1 + 3 + 5 = 9, 1 + 3 + 5 + 7 = 16, etc). So he could figure out when to bump the dependent coordinate value by iterating in a loop until a threshold was exceeded. This allowed QuickDraw to draw ovals very quickly. At MacHack, when most of the original team was there and Andy told this story, Jef Raskin spoke up to say that he had told Steve about round rectangles being everywhere, and that's what got Steve obsessed about them. But what I found interesting was something Bill Atkinson said about creating the RoundRect routines. He said they turned out to be a lot easier to create than he thought they would be. I can't tell you how many times I've over-estimated something easy. I think it's something inherent in computer work. What I find interesting about this story is the complete lack of support for RoundRects in Cocoa and its predecessors. I needed them for an old program I was rebuilding for OS X recently and ended up rolling them by hand. I was at IBM back in those days, and was one of a few evangelizing for support for the kind of applications and user interfaces then showing up on the LISA, Mac, Xerox Star etc. I worked for a division which did applications, and part of my job was trying to drive requirements into the personal systems division. I became infamous as one of the guys who went to Boca Raton and Hursley in England and talked about bit-mapped graphics. Most of the guys at IBM doing graphics those days came from a tradition of mainframe based CAD, and just couldn't understand guys like me, and in particular why we wanted rounded corner rectangles! Amazing story. 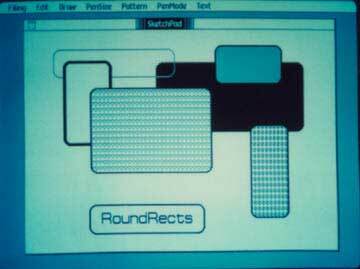 I can't even imagine the early user interface without roundrects - all the buttons and desk accessories! There's a lot to say about people wondering why on earth graphical interfaces would've been neccessary to introduce (the IBM CAD folks here mentioned above). It's the psychology of keeping the status quo and inside-box thinking that still revers today. The trick with prime numbers and iteration to get to rond lines is magnificent. The day I got introduced to Laplace transformations I immediatelt understood the importants of simplifying complicated functions for graphics computational purposes. But reducing geometric graphic drawing to mere plus and minus operations, well that's the genius! There's a book out on such things like magic with numbers by Alex Bellos "Alex's Adventures in Numberland" at Bloomsbury. It's mentioned there.